Pam Blodgett-Tracy, RMA; Angela Stone, CCMA; Kristy Hilton, APRN-FNP-C; Emily Wiggins-Rider, CCMA; Jessica Wuori, CCMA; Deborah Burchfield, DNP, APRN, FNP-C; and office staff: Misty Schoff, Debbie Seeley and Becky Jeannette. 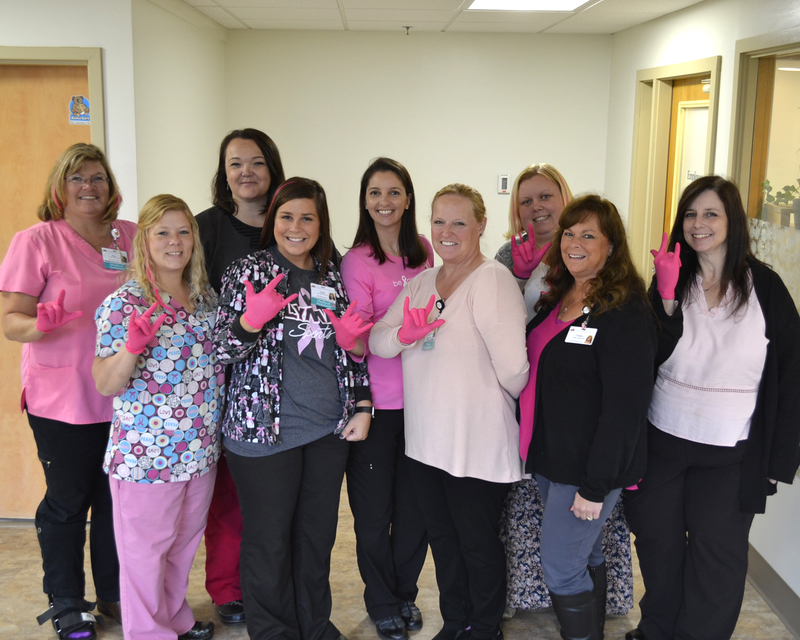 FARMINGTON - Staff at Franklin Health Primary Care in Farmington are wearing pink and many are also sporting hot pink hair extensions in observance of breast cancer awareness month. They would also like to take this opportunity to remind community members to stop by their open house on Saturday, Oct. 6, from 10 a.m. to 2 p.m. at the practice’s new location in the Mt. Blue Health Center on the Franklin Memorial Hospital campus. Anyone with an interest in visiting the offices, meeting the staff, and finding out more about services offered is invited to attend.